This article employs Koike Mariko’s novel Koi  as a case study to explore the functions of urban space in contemporary Japanese fiction. It examines the way that urban space works as an axis upon which the characters in Koi interact, and analyses how those interactions function in direct proportion to the nature of the urban space through which they move. This article also analyses the plot paradigm of ‘sexual deviance/transgression during periods of social turbulence’, and identifies the interrelations between sexuality and socio-political factors. The representation of urban space in Koi, together with the socio-political backdrop of the 1970s student movements, is shown to complement the construction and development of the characters’ sexualities, thereby enriching the narrative and supporting Ai Maeda’s claim of urban space’s impact on literature. It is difficult to ride a bicycle or drive a car while wearing a kimono. Kimono are not considered suitable for contemporary life in Japan, and because of this, there is a pervading view that the Japanese traditional textile industry is in decline. However, Japanese designers and consumers are redefining Japanese clothing (wafuku) while retaining its ‘traditional’ image. This project investigates how the contemporary reinvention of Japanese clothing embodies the process by which tradition and modernity interact, and helps us understand how new designs are a vehicle for designers’ and consumers’ expressions of Japanese culture. 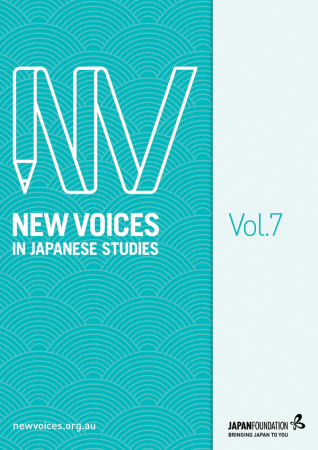 This article investigates the value of publishing for emerging researchers, using the specialist postgraduate journal New Voices in Japanese Studies as a case study within the Australian and New Zealand context. In doing so, it offers insight into the aims and editorial processes of New Voices in Japanese Studies and examines the benefits of publishing during research-degree candidature, drawing on feedback from recent contributing authors to provide an emerging scholar’s perspective. The article also touches upon the history of the journal, documenting how it has changed over time, and introduces the papers published in the most recent edition, Volume 7.